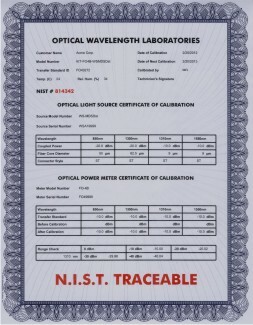 Optical Wavelength Laboratories (OWL) meters and sources are traceable to the National Institute of Standards and Technology (N.I.S.T.) for popular testing wavelengths. 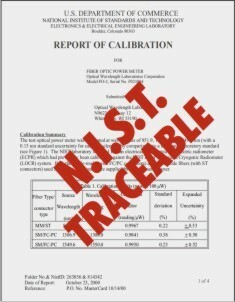 Traceability to N.I.S.T. means that a product has been calibrated against a known U.S. Government standard, and ensures that the product's calibration procedure can be verified through an unbroken chain of documents. N.I.S.T. calibrates a single piece of test equipment and provides manufacturers with a report of calibration as proof of calibration according to their standard for this equipment. This report of calibration gives us a point of reference by which we can set the accuracy of our optical fiber test equipment. All of our meters and light sources are set to this point of reference with the U.S. Government equipment. Our customers can rest assured that the popular wavelengths in their equipment is calibrated to U.S. Government standards, and provides them with the greatest amount of accuracy possible. WHY IS N.I.S.T. TRACEABILITY IMPORTANT? 1) High-end corporate and government bids require that test equipment used to test network installations, including fiber optics testers, be N.I.S.T. traceable. 2) Quality standards such as ISO 9000 often require annual re-certification of test equipment and that such records be available for audit. 3) Certification and N.I.S.T. traceability often become a vital shield in potential litigation or arbitration of quality of work done for clients. 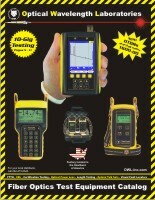 CLICK HERE FOR MORE INFORMATION ABOUT RE-CALIBRATING OWL TEST EQUIPMENT.